In a few short weeks on April 7 – 9, thousands of the world’s best marketers will descend on San Francisco for Marketo’s The Marketing Nation Summit. LeadMD is a platinum sponsor and we’ve been big fans of Marketo from the very beginning. As we’ve discussed in a previous blog, content marketing is already and will increasingly be a large driver of top-of-funnel engagement. Marketing departments are dedicating budgets to content and formalizing content creation with tools like Kapost. With all this content, comes the inevitable content deluge and shock. This is why we’re working with ShareBloc to find the best content for marketing automation and we’re giving away a free ticket to Marketing Nation Summit to the winner. ShareBloc is a new San Francisco-based startup that helps professionals find the best business content. They launched last December and are initially focused on helping marketers and salespeople curate the best content out there through sharing and voting. We ran a contest with them previously to find the Best Content Marketing Posts of 2013 and it was a huge success, with participation from executives at companies like Marketo, Salesforce, Hubspot and Infusionsoft. Now we’re running a contest just for marketing automation experts. Here’s how to participate and win. Marketing automation is already a big business and according to (what we believe to be a conservative estimate from) Frost & Sullivan, it’s growing to become a $1.9 billion industry by 2020. Already, 5% of companies have started using marketing automation, which means there are 95% of C-suite executives that currently don’t yet understand the value of marketing automation. Can you help us find the one defining piece of content that will convince these executives to catch up with the rest of us? The person who posts the top-voted content piece will be the winner of the free pass to Marketing Nation Summit! What should you post? It can be any form, like a blog post, eBook or a video. It can also be a post by Jon Miller or your original content. We encourage you to get your friends to support your entry. But to avoid gaming the system, representatives from LeadMD, ShareBloc and the other participating sponsors of the contest will have 10 votes per day instead of the three you have to help curate. We can’t win so we’ll only be looking for the best content out there. The contest launches on Tuesday March 11, 2014 so go to ShareBloc.com/contest or watch this blog for more information. ← Why are you sleeping, (unengaged lead) fishy??! 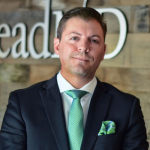 We are really excited to work with LeadMD on this! I can’t wait to see all the submissions and find out who the winner is! Best of luck to everyone.